Five years into an acquaintance we struck up around a sealed bottle of Iris Gris, my friend Octavian Coifan became a “character” in The Perfume Lover, something he recently wrote about on 1000fragrances. On Easter Sunday, he gave me the perfume he had composed as a fragrant translation of the journey into white flowers we take together in Chapter 18 (to read the post, click here). It’s called Shanghai Lily. Here’s the transcript of the scene from the screenplay by Jules Furthman, who also wrote the scripts of two other of my cult movies – both featuring dames who are no better than they have to be, which is very good indeed --, To Have and have not and The Big Sleep. Dr. Harvey: Well, you've changed a lot, Madeline. Dr. Harvey: Let's see. Exactly how long has it been ? Dr. Harvey: Well, for five years and four weeks, I've thought of nothing else. Dr. Harvey: You have, Madeline. You've changed a lot. Shanghai Lily: Have I lost my looks? Shanghai Lily: The notorious White Flower of China. You've heard of me, and you always believed what you heard. Like white flowers, women of easy virtue intoxicate as much as they shock. The paragons of puritan self-righteousness aboard the Shanghai Express forgot that virtue wasn’t necessarily predicated on the ability to hold a penny between one’s knees when men are around: in its original sense, it meant “worth” and “bravery”, something Marlene’s Lily/Madeline had in spades. And when she did reunite with the man she loved, she did it on her own, sovereign terms, not because she repented her evil ways and turned into a blushing English rose… The Hayes Code hadn’t yet picked up steam in 1932, and leading ladies who’d known more than one man weren’t compelled to die in the end. What a lovely gift indeed, you are building a little collection of scents built around special moments, you lucky lucky girl! Going back to your book, the parts where you describe the development of Duende are so "smellable" that I am glad Seville a l'Aube is not out yet to influence the reader's nose while reading about the different mods. I knew it would be good, but you have outdone yourself. Brava! I'm kind of comforted by what you say about the scent not being out for readers to compare with mental impressions, though of course reviewers got samples. I'm still sorry the launch of Séville à l'aube couldn't happen earlier, but that was totally out of my hands. And thank you for your kind words about the book. Nicola, the phrase is by the French poet Paul Valéry, and was used in the promotion of Poison, which of course I admire greatly as well. I'm very touched that you were moved by the Mary Magdalene chapter, which in many ways is, to me, the soul of the book. And that scene... isn't it brilliantly written? Furthman was great at writing dialogue for wordly female characters. I mean, we do owe him "You know how to whistle, don't you Steve? You just put your lips together and blow." GGS, Octavian and I became friends even before I started blogging. He's taught me so much! Also, it kind of helps he lives about 15 minutes away from my place, so our long afternoons of smelling different things are easy to arrange. What a beautiful homage... and Octavian is the friend every perfume lover wishes! Our encounter at escenxe was very brief, and the setting was full of confusion, scents and excesive heat, but your elegance and presence stood out: I see how you could inspire a perfumer and a friend to compose a scent for you! I didn't know about Shangai Lily - that dialogue is wonderful and I'm going to track down the movie! Zazie, that's very kind of you to say -- Esxence was really crazy and I wish I'd planned for it more carefully, I had no idea! Please do seek out Shanghai Express. If only for the shattering beauty of the cinematography, it's worth seeing. Oh yes the white flowers of the night! And captured stunningly in the gorgeous Seville a l'Aube...I cannot wait to get my full bottle. 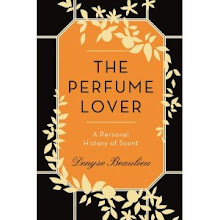 I am fascinated by how the perfume is so evocative of the concepts you expressed in your wonderful book, that I simply could not put down until devoured from beginning to end! Marion, I'm very happy the perfume and the book thrilled you! Thank you. 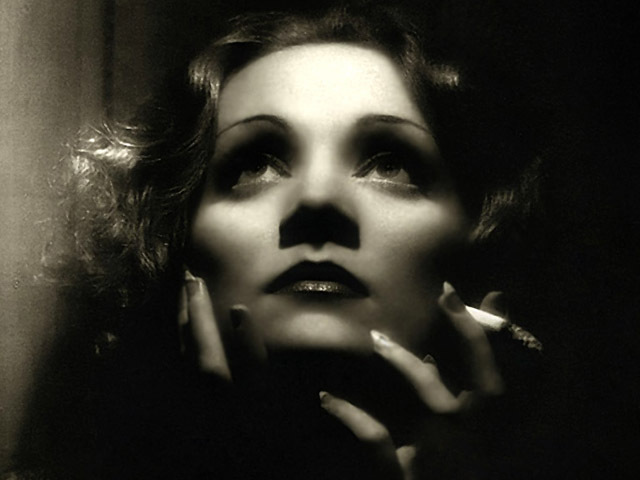 Marla, and as Marlene is already a condensation of Marie Magdalene, that makes you double distilled -- "Spiritueuse double Madeleine"? 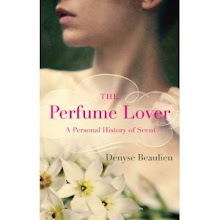 What a lovely story about the perfume and what coincidences ;-). You are really lucky girl. Civava, I think Octavian would answer than with perfume there are no coincidences, just poetic links between things... And I guess I agree! That's the magic... And, yes, I do appreciate how lucky I am!